Is learning disability determined from birth? Psychoanalysis has always striven to reconstruct damaged human subjectivity. However, with a few exceptions, people with learning disabilities have long been excluded from this enterprise as a matter of course. It has been taken for granted that learning disability is a deficient state in which psychodynamics play but a minor role and where development is irrevocably determined by organic conditions. First published in German in 1980s and published here in English for the first time, this brave and provocative book was one of the first to attempt to understand learning disabilities in terms of psychoanalysis and socio-psychology. Controversially, the author does not distinguish between a primary organic handicap and a secondary psychological one; rather, she argues that it is developed from the very outset of the process of socialisation during the interaction of caregiver and infant, and therefore gives the analyst room to work on this maladapted socialisation. She illustrates the effectiveness of this theory when put into practice in a number of illuminating case studies. 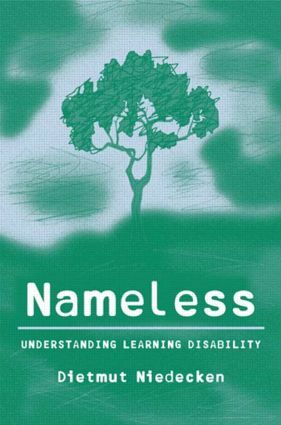 Still as influential and powerful as when it was first published, Nameless will be of interest to psychoanalysts and clinicians from across the mental health services who work with people with learning disabilities.